It's been over a year in the making, with a few bumps along the way, but Electra Michaelidou's story Steel Punch is the most exciting Comic Book Project launch of 2017. 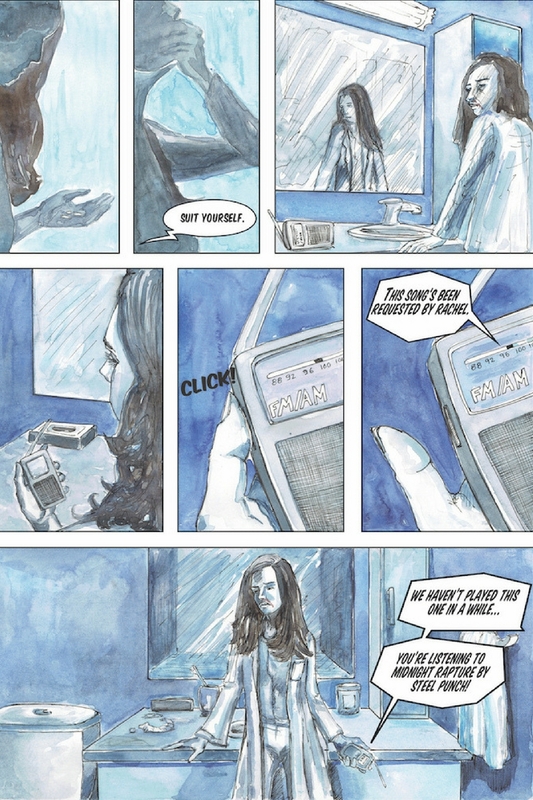 Featuring original artwork by Nicosia-based artists Nicos Nipat and Ioanna Epaminondou, and a kickass cover by Athens-based artist Aniro, Steel Punch tells the story of an ex-heavy metal rocker who confronts her ghosts at a bar she used to play at. We sat down with the team a few days before Comic Con 2017 to ask them about their work on the book and what it was like to collaborate on the fourth issue of the Comic Book Project. WRITE CY: Electra, you’re a writer. I think a lot of writers think about turning stories into comics from time to time. What made you choose this story in particular? ELECTRA MICHAELIDOU: This particular story had been sitting on my mind for about a year or so. Initially, I was going to write it in the genre of creative non-fiction, and it was going to be a biographical piece about one of my favorite musicians, Gigi Hangach. Gigi and her band were around in the late 80s and early 90s, and they were based in Los Angeles. Having never been to Los Angeles, and also having not been born until 1992, it would have been a very difficult task for me to collect enough information to write an accurate story depicting life at the time. By turning this idea into comic book material, I managed to focus more on the visual aspect of storytelling, and I brought a lot of fiction into it as well, which allowed me to express myself in a way that differs from what I normally do. WCY: Ioanna, this is the second issue you’ve worked on for the Comic Book Project (yay!) When we open up your comic books, your painterly style is immediately recognizable. Why did you choose to work like this, rather than in a more identifiably comic book style? WCY: Nico, you’re usually working on a drawing from start to finish. For this issue, you were in charge of penciling. For a whole lot of people out here who have no idea how comic book illustrating works, can you tell us what it's like to pencil? How comfortable are you turning your drawings over to someone else to color and ink? NICOS NIPAT: Although I usually ink my work—and that's where I like to add most of my details—I enjoyed taking the role of the penciller in this project. The penciller, with the writer's guidance, determines the look of the comic and lays down the base drawing (composition and flow) upon which all further art is built. First, I had to meet with Electra and sketch the thumbnails (panel compositions) for the whole comic book, from the script she provided, and from there I proceeded to illustrate the full comic in pencil. When that was done, I gave the penciled comic book to Ioanna to work her inking and coloring magic! That's the part where things come to life! WRITE CY: Electra, how much did you participate in the process after the script was finished? Were you all bouncing ideas or did you just give Ioanna and Nicos carte blanche? EM: Nicos and I spent a lot of time together initially, reading the script and sketching each individual panel to ensure it could be as close to what I had in mind, but also that it could actually work. Sometimes I would imagine certain panels in my head that would be nearly impossible to draw on paper. When all the sketching was done, we proceeded to take some reference photos and then had a meeting with Ioanna to discuss the use of color in my comic, which is vital in terms of storytelling. Not wanting to interfere with Nicos' or Ioanna’s creative process much, I then quietly observed them as they worked, occasionally checking in on them and answering any questions they might have had regarding the script. I let them do their thing and had faith that it would give great results—and it did! WCY: This question is for all of you. What’s it like working together as a team like this? Did you hit a rhythm where you were synced artistically and getting where you wanted to go? Were there any rough patches? Is it something you’d want to do again? EM: There were no rough patches as far as I’m aware, and working as part of the Steel Punch team is definitely something I enjoyed thoroughly. I usually prefer to work by myself, but when you have the right people by your side it can drive and motivate you so much more. It’s essential to have people around you who can come to you with honest feedback and suggestions—you need to talk less and listen more, I believe, because that’s the only way you can improve. The only difficulty was trying to coordinate meetings, even short ones, because each of us has a different schedule and we were all busy at different times, so that slowed down our pace a little bit. It made little difference overall, though, since we were all very dedicated to this project and in the end managed to achieve a result we can all be proud of. IE: It’s always a great joy working with others, as artists of all kinds generally go through great isolation periods when they are at work. I feel that as a team we really valued that, enjoyed every minute of it and found great ways to be super productive in each of our individual hectic schedules. Of course, there were big periods when we worked individually but still, we always had the rest of the team a message away. Everything was flowing smoothly and I would definitely collaborate with each and every one of you again! WCY: Any comic book writing plans on the horizon for any of you? EM: I don’t have any concrete plans in mind, currently, but that usually seems to be the case with me. My writing comes in random sporadic bursts, and that’s not necessarily a good thing, but for now it’ll do. I do have two creative ideas floating about inside my head—one of them is writing for children, which I will be attempting soon, and the other is combining my non-fictional poetry-prose writing with photography, into one book. How, you might ask? I’m unsure. But stay tuned! IE: I actually undertook, along with The Art Hub team, the artwork of Marianna Pagkratidou’s PhD proposal comic! Yes, a PhD based on a comic! Marianna is researching in the field of cognitive and experimental psychology, focusing on the theme of human spatial memory. We will produce a series of stories which will explore how people encode spatial information through narratives, and in this case, a comic. So, we will be actually producing four mini comic books with different stories—we have a lot of work ahead of us! We are very excited to be working on this since it’s extremely interesting to be in a process where scientific results are extracted. And of course, having the opportunity to make more comics! Find out more about the Comic Book Project and how you can get involved by visiting us at our virtual home.